Saffron could be described as the prima donna of the spice cabinet. For starters, it’s the most expensive spice (by weight) in the world. In addition, it requires special treatment to fully extract its unique flowery, pungent, almost bitter character and deep orange color that make it indispensable in bouillabaisse, paella, and a host of other traditional dishes. Saffron’s high cost is due to the fact that the threads are the actual stigma of a particular crocus flower and must be harvested by hand. Fortunately, a little bit of saffron goes a long way. In fact, too much saffron can ruin a dish with an overpowering, medicinal taste. So in practice, saffron actually costs not much more than most seasonings. When shopping for saffron, look for evenly colored, vivid red or deep orange threads. Lighter colored threads or a lot of pale streaks indicate lesser quality. Avoid powdered saffron, which is always cheaper but often inferior and adulterated with other flavorings. Crush and soak saffron to release its flavor. 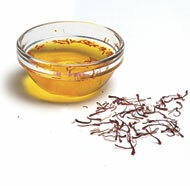 Saffron threads are quite frail and can easily be crumbled between your fingers, although for a more uniform powder, use a mortar and pestle. Measure (or count) saffron threads before crushing. A “pinch” is about 20 medium saffron threads. Saffron needs moisture to release its flavor. The best way to extract flavor from saffron is to soak the threads in hot (not boiling) liquid for 5 to 20 minutes. Then add both the saffron and the liquid to the recipe. As the saffron soaks, you’ll notice the distinctive aroma indicating that your saffron “tea” is ready. I like to soak the saffron in stock or wine (rather than water) to add to the overall flavor of a dish. When adding saffron to soups, stews, salad dressings, and other recipes with a lot of liquid, you can simply toss the crushed threads in with the rest of the ingredients. I still find, however, that I get a deeper, more pervasive saffron flavor by first soaking the crushed threads and then adding them. 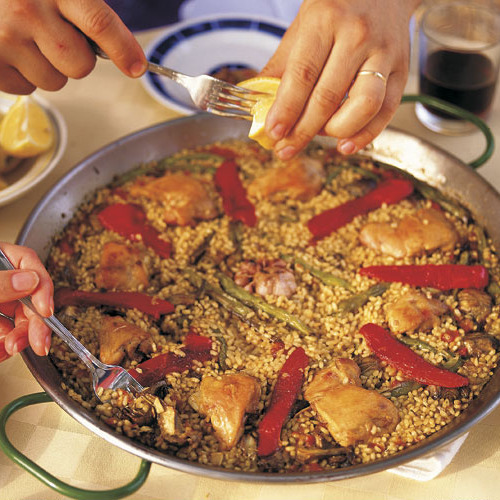 For traditional paella recipes, cooks first toast the saffron threads in a dry skillet to bring out the volatile flavors. I don’t usually bother because I’ve found that this step makes little difference in the final flavor of the dish.